John Van Hamersveld "Surf Culture"
Our sport holds certain iconic imagery that proves as timeless as Mother Ocean herself. 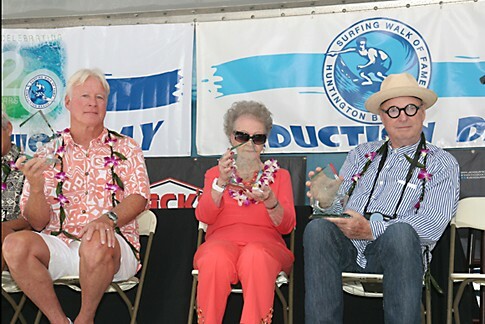 And perhaps the most notable would be a piece by this year’s Surf Culture recipient. John Van Hamersveld’s movie poster of Bruce Brown’s The Endless Summer is perhaps still the most recognizable surf artifact in circulation. In fact, the Los Angeles based artist did a 35-year anniversary edition run and signed copies went for $750. 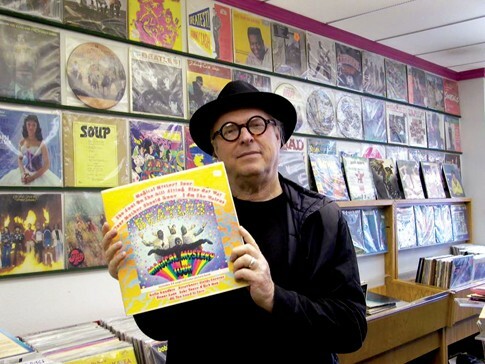 Before being thrust into international acclaim that included album cover art for musical acts like the Rolling Stones, Bob Dylan, The Beatles, the Grateful Dead and more, Van Hamersveld paid his dues like any real surfer does. 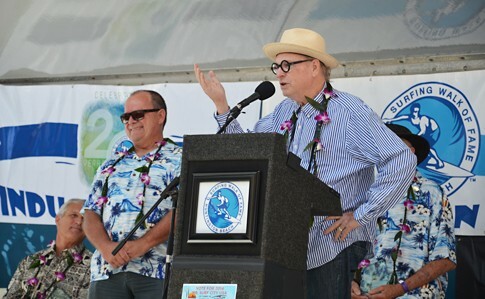 He studied at the Art Center College of Design in LA and, upon graduation, put in a one-year stint as the graphic designer for Surfer magazine. PHOTO: John’s iconic neon illustration of three surfers on the beach has influenced generations of art directors. 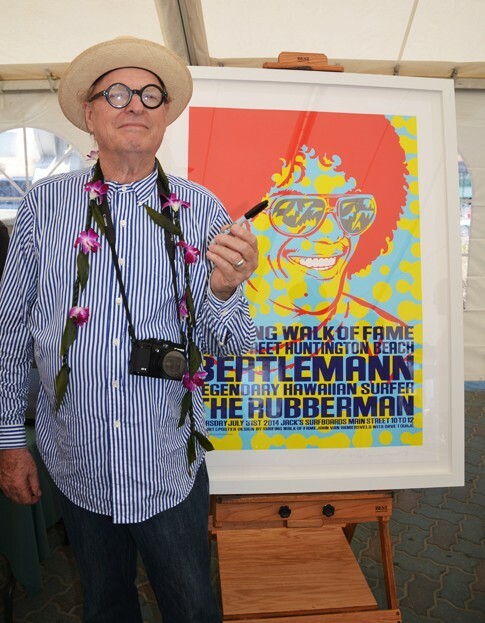 PHOTO: John Van Hamersveld with his special induction poster recognizing Larry Bertleman. Photo courtesy of Lew Harrison. 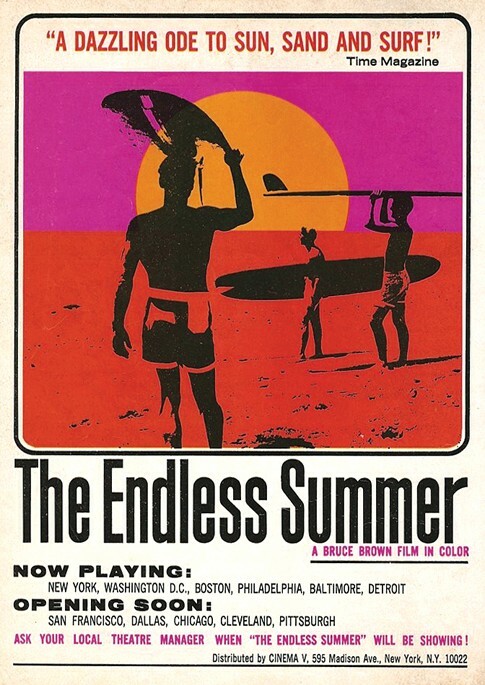 Van Hamersveld’s inspiration for The Endless Summer poster stemmed from Brown showing him the opening scene of the film. In January 1964, the artist set up a photo shoot with Brown and the film’s two stars Robert August and Mike Hynson walking towards the setting sun. The photo turned to an abstract playbill by reducing each image to a single tone and giving each image a single, hard edge – a technique he learned in college. A lithographed copy of the legendary poster sits eternally in the permanent collection of the New York Museum of Modern Art, while Van Hamersveld is now immortalized in the Huntington Beach pavement along side other surfing legends. PHOTO: John Van Hamersveld giving his acceptance speech. Photo courtesy of Sharon Marshall. PHOTO: Induction Day 2014, Rick Rarick, Mrs. Haley andJohn Van Hamersveld. Photo courtesy of Sharon Marshall.